During the AnalyticsWeek in Boston, March 24 – 28, 2014, Klurig Analytics, as a Silver sponsor, handled the social media and social media analytics for the event. This primarily involved keeping a live tweet stream including both text and pictures of speakers, moderators and panelists as well as handling the social media analytics. In a previous post, we gave a blow by blow description and presentation of the event. 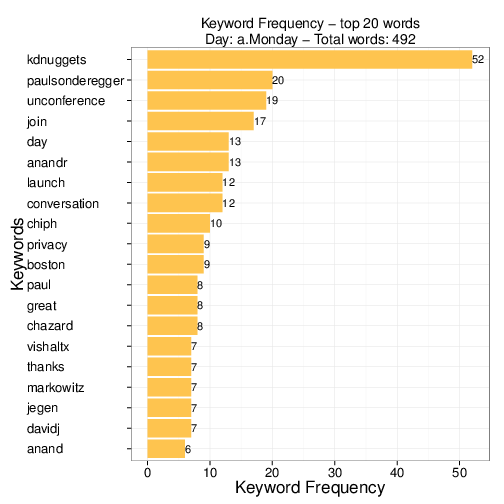 Klurig Analytics used the twitter handle @AnalyticsWeek. AnalyticsWeek was organized by Cognizeus. 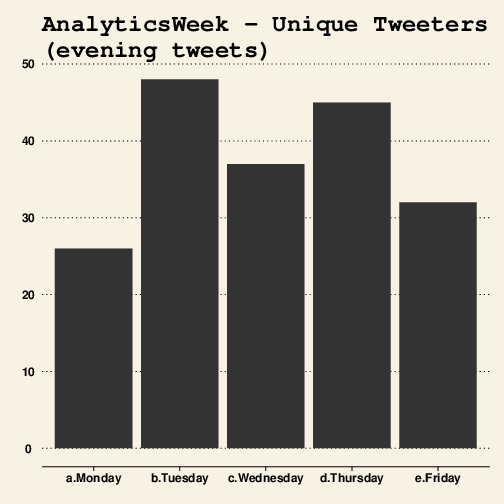 In this post, we will walk through the AnalyticsWeek tweets based on the social media analytics. Klurig Analytics’ specialties are social network analytics and text mining. Combing those two disciplines with data Twitter data and we get a powerful set of knowledge about a community and an event. Each evening, we tweeted a very comprehensive tweet stream (at times, many tweets per minute) with the hashtag #bosaw2014. In addition, while the event was on, periodically and automated, Klurig use the Twitter API to download the latest tweets for the hashtag to automatically generate graphs and tables for up to the minute understanding of users and keywords. Through each presentation, we shared the names of top user (most frequent Tweeters) information on Twitter together with a message to each of the top users. This personalized message help generate additional buzz about the event. For the whole week, we had 125 unique users tweeting about the event. We also shared the information at the end of each evening with the organizers so that they could give out a prize to the user who tweeted the most. The above graph shows the total number of tweets for each evening. It should be pointed out, as we will see further down, that @AnalyticsWeek was the top tweeter by far and these numbers includes @AnalyticsWeek. The first night, Monday night was a bit slow but mostly because this was the first night. The remaining nights, we jacked it up to about 300 tweets per night – a tweet a minute – with a top on Thursday night at the Microsoft NERD center discussing Marketing and big data analytics. These are the unique tweeters for each evening and it is on average 35 unique tweeters per night. As we can see, Healthcare Informatics at Microsoft NERD got most unique users tweeting. It is interesting to see that both top nights were at Microsoft. Were there more people at Microsoft because it is more centrally located, closer to Kendall Square, more known than District Hall or Hack/Reduce? Or are there other reasons? It makes sense that Friday night is a slower night as some people check out immediately after work. It also seemed that there were less people attending on Friday. Sentiment analysis is not an exact science but it gives an indication of the mood of a group. In our case, the mean sentiment per evening is interesting. Clearly, Friday is the happiest evening – perhaps because it is Friday. On the other hand, my guess is that people displayed a good mood because Greta Roberts gave such a great keynote address with many surprising and positive comments. Wednesday at Hack/Reduce talking about Finance and Insurance also got people in a better mood. Christopher Lynch gave a fantastic keynote address with a good amount of humor included, which possibly helped raising the mood. Cause and effect is always tough. Either way, based on the sentiment, overall for the AnalyticsWeek, it was a very successful week with people enjoying the keynote speakers, moderators, panelists and the great opportunity to network with great people. Kudos go to Cognizeus for the organization of the event. This chart shows the number of tweets as measured in 10 minute intervals during each night from 5pm to 10pm. Two take aways; first, each evening started on time except for Friday which started about 30 minutes late as we were waiting for additional people. Secondly, it seems that there were more tweets during the keynote address as compared to the panel discussion for Wednesday, Thursday and Friday (close), while the opposite on Monday and Tuesday. Not sure why. It might be easier to tweet during keynote address because it is only one person talking while more jiggered during the panel discussion because more people talking. Unclear on that one (sometimes, there is a tendency to pattern-match random information). Showing the sentiment in 10 minute intervals. Not much to see except for the fact that on Friday, people seemed to get happier as time when on. The other days, things seemed to stay the same over time. In this chart, we are using cluster analysis to try to understand if we can see a difference between each evening event. Each event has a different topic so a cluster analysis could potentially detect that. Based on the tweets, it is tough to see a difference, except for potentially Tuesday, Healthcare Informatics, which seems different from the other evenings. Top keywords over the whole week, which words were used the most in all tweets (after stopwords have been removed). Boston is used the most, perhaps not surprisingly. Every time we tweeted (as AnalyticsWeek), we added the name of the speaker to the tweet so the number of times a person’s name shows up is a function of the how long they spoke and how many times they were tweeted during their speech. In this case, it seems that Judah Phillips and Greta Roberts got the most tweets. There seems to be a lot of tweets on the health track with marketing and workforce analytics close after. Note that this is one of these charts that can be done a few different ways. For instance, should you include the twitter handles of those people speaking? Should you include potential words such as day and top? It all depends on what you are looking to display. In this case, apart from stopwords, we display it all. The above graphs shows the top keywords on a nightly basis, primarily used just to verify that there are differences, which we also noticed for the cluster analysis above. Yes, the top tweeter was yours truly, @AnalyticsWeek, as stated above. The remaining tweeters are as listed above and we say thank you to all of you who helped us socialize this event. Interesting fact is also that there were a total of 125 unique people tweeting during this event. All work is done in R, using the twitteR, ggplot2 and ggthemes packages – thanks to the authors for making these packages available to the open source community.